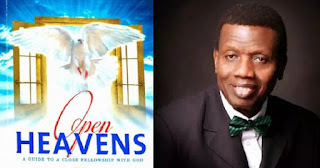 Open Heaven [29 April 2018] It Came To Pass - Open Heavens Daily Devotional Messages, By Pastor E.A Adeboye. There is a phrase commonly used throughout the whole Bible which should serve as comfort to all Christian pilgrims, particularly when they are passing through situations that are not so pleasant. That phrase is the title of today’s devotional – “It came to pass”. To someone using this devotional today, all your challenges shall pass in Jesus’ Name. The Lord Jesus Christ did not promise us that the Christian walk would be a wall in the park. He actually promised us persecutions and trials as part of the Christian experience (John 16:33, Mark 10:30). He even said in Matthew 10:22 that a time will come when will be hated all men. Be aware that this time is fast approaching. What is expected of us is endurance and long-suffering. As God would have it, long-suffering is part of the fruit of the Spirit, which is made manifest in our lives as we daily walk in the Spirit (Galatians 5:22). In Revelations 22:12-14, the Lord also spoke of the reward we will receive, having endured unpleasant situations in this world. Beloved, the Lover if your souls, Jesus, will soon appear; be of good cheer therefore because all your trials of faith will soon be over. Just make sure you do not deny the faith. Don’t be like Demas who loved this present world and forsook the Lord (2nd Timothy 4:10). May the Lord keep you holy till His appearing in Jesus’ Name.